As the numbers of people reading this blog trippled when I used the word ‘gossip’ in the title I thought I’d use it again! I’m up for anything to get more readers! Well, the Wood For Winter Warmth seminar had about 30 people there in total (more than expected – another bet lost!!!). It was also nice to be able to give a flavour of Your Big Ideas that will be shared on Sunday in the village hall. Hopefully the lure of knowing what nearly 500 people had to say about your village will pursuade you to battle the expected elements on the day. Hopefully Vikki (Hilton) and I will be able to make it through the snow too. After we have your feedback it will be head down and drafting the community development plan, working on the AD plant proposal (or any other options that can provide community benefit to help achieve our aims), maybe a tour of successful projects similar to our objectives across Scotland and an assessment of what we have achieved so far with the lottery. So, for a while at least, you may not have me asking you to attend this or that event to give your views (snow pending of course!). I really hope you can keep the momentum going and make it for the ‘Your Big Idea’ drop in session on Sunday. I have to say people in the village should be proud of themselves as they have been absolutely brilliant and supportive during this whole process. I hope the completed development plan will be a fantastic ‘road map’ to follow. Finally – good luck to Lisa and the rest of the Powerdown team who find out on Monday if there is funding so they can continue the good work they have achieved in the last two years. 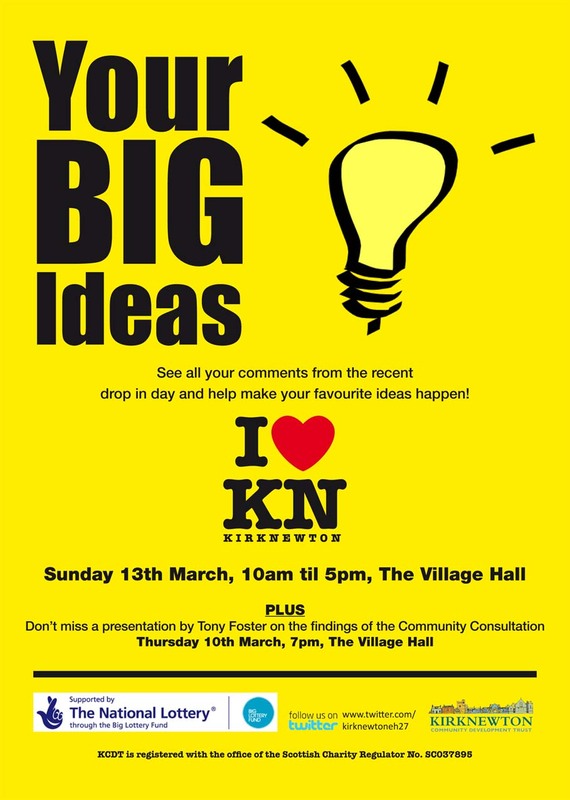 Many of you expressed a favourable view in the I Love Kirknewton Community Consultation about the work of the Trust during that time and I’m sure many in the village will have their fingers crossed over the weekend for a positive result.